Millions of people are already banking, paying bills and interacting with their suppliers and customers online. Using digital tools to help manage business income and expenses and get their tax right builds on this momentum and will help businesses get more in control over their finances. 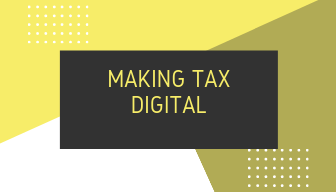 Making Tax Digital is a key part of the government’s plans to make it easier for individuals and businesses to get their tax right and keep on top of their affairs as well as transforming HMRC into a world leading digital tax authority. HMRC also hope that it will help collect the estimated £9billion in tax revenue that is lost from ‘mistakes’. At present HMRC is only implementing the MTD scheme for VAT. MTD for VAT is mandated as of 1st April 2019. Although there have been rumours that this date might change or that MTD might be cancelled entirely HMRC have issued a VAT Notice making it fully official. Also on Tuesday 16th October 2018 HMRC opened their pilot scheme and deferred a small number of more complex businesses. HMRC says that whilst the complete set of digital records to meet MTD requirements do not all have to be held in one place or program, there must be a digital link between the pieces of software used. In reality this means moving to a digital or cloud accounting packages. Notably, MTD for VAT has the ‘force of law’ and is therefore a mandatory requirement. Outside of a handful of narrow circumstances you cannot opt out of MTD for VAT. And whilst you might use an Accountant for your VAT, you will still need to keep some financial records digitally if they pertain to your VAT accounting. For VAT registered businesses with a turnover of over £85,000 MTD will be here in April 2019. If this is your business you will need to purchase/update your commercial accounting software to a MTD-ready version BEFORE 2019. If you submit VAT manually through the post or online using the existing Governement Gateway tool you will almost certainly have to integrate commercial software into your business BEFORE April 2019 as these forms of submissions will NO LONGER be accepted by HMRC. If your business chooses to join the PILOT SCHEME that was opened earlier this week then you will begin submitting returns via MTD before April 2019 and it will give your business more time to prepare before it becomes compulsory. For businesses needing to use digital software for the first time there are a number of providers that will offer this on a subscription basis and they have packages tailored to your company’s needs. The main providers are Sage, Quickbooks and Xero – they all pretty much do the same thing however different businesses might find one preferable to others. Please give us a call to discuss your personal circumstances. The cost of these packages are around £25 per month and therefore approximately £300 per year. Do not forget that you will probably need time and training to implement the new software into your business. The costs vary enormously from business to business but you should allow a reasonable bedding in period. Lots of our clients have decided to run the new software alongside their current system to ensure it’s working properly. Prevention of late filing and errors – By automating submission MTD will assist businesses in managing their tax affairs by alerting them before payment is due and keeping them on top of their tax liability. Because you are keeping track of your sales and purchases in ‘real time’ and not just leaving it to the end of the VAT quarter you can see in ‘real time’ what your VAT liability is at any point during the quarter and not just at the end when you add it up and have to pay it over. This prevents payments from adding up and reduces the chance of error and incurring penalties. What is MTD enabled software? My business doesn’t use digital software. We use Excel and paper. How will it impact me? From 1st April 2019 it will be mandatory to keep your records digitally and submit your VAT returns to HMRC using MTD-enabled software. Whilst a spreadsheet is a valid digital record you will need to make sure that it is either API enabled (that is it can submit your VAT return to HMRC via an API link) or it has a link to other MTD enabled software. Cloud accounting software can help you monitor this monthly so that you comply with VAT registration requirements. The 6-month deferral applies to customers who fall into one of the following categories: trusts, ‘not for profit’ organisations that are not set up as a company, VAT divisions, VAT groups, those public sector entities required to provide additional information on their VAT return (Government departments, NHS Trusts), local authorities, public corporations, traders based overseas, those required to make payments on account and annual accounting scheme users. The deferral will apply to around 3.5% of mandated customers. The specific details for the penalty regime for MTD is still under consultation and options include a points based penalty system where an accumulation of points incur a charge. Existing penalties for late submission or error will apply. Will I be allowed time to get used to the new system? MTD goes live on the 1st April 2019 and if eligible for VAT your business must be ready. There are no exceptions. However the requirement to have your VAT accounting system ‘digitally linked’ is not mandated until April 2020. If you think you are going to need time to get used to the system then we strongly recommend that you sign up to the pilot scheme. A pilot for the new online VAT service was launched this week on Tuesday 16th October 2018. HMRC will be inviting over half a million businesses to try it ahead of the new rules coming into force in April 2019. It is open to businesses whose affairs are up to date and straightforward and will extend to most other business types over the coming months. If you think that you may struggle to meet MTD obligations then we strongly recommend that you sign up to the pilot so you can get used to using the system before you are obligated. Are you currently under the £85,000 VAT threshold? If you need to implement new software consider when the best time to do this is – maybe at your financial year end? Are you submitting through HMRC’s online gateway? Are you using Excel or paper? Will your current methods/software allow you to submit through the API once MTD comes into effect? Do you have any adjustments to make before April? The faster you get started and outline what you need to do the better. It’s no good sticking your head in the sand, MTD is not going to go away!